“The Magic Flute” is a combination of “Star Wars” and “Romeo & Juliet” as presented in Simon McBurney’s vision of the opera at the Coliseum. Written in 1791 by the 35 year old Mozart, “The Magic Flute” puts into unmatched music drama the philosophical ideals of “The Enlightenment.” Tragically this was Mozart’s last opera as he died just after completing it. If you are struggling to wade through Steven Pinker’s graphs and statistics in his “Enlightenment Now” (2018), then take a break and go and see “The Magic Flute.” It does what only art can do; makes complex philosophical ideas comprehensible through drama, music and singing. The lighting is overwhelmingly dark and only becomes brighter as our heroes get nearer to Enlightenment then bang, we are bathed in glorious sunlight from the Gods; Isis and Osiris. A genius video screen allows for a live chalk artist to handwrite captions on a blackboard (like one of those Walt Disney cartoonists) and we see them simultaneously projected onto the screen. All in black and white it gives the production an integrated coherence. The “Star Wars” metaphor works especially well. The Darth Vader figure is the Queen of The Night (Julia Bauer, brilliant) terrifying as she travels around the stage in her black wheel chair pointing her stick at all and sundry. 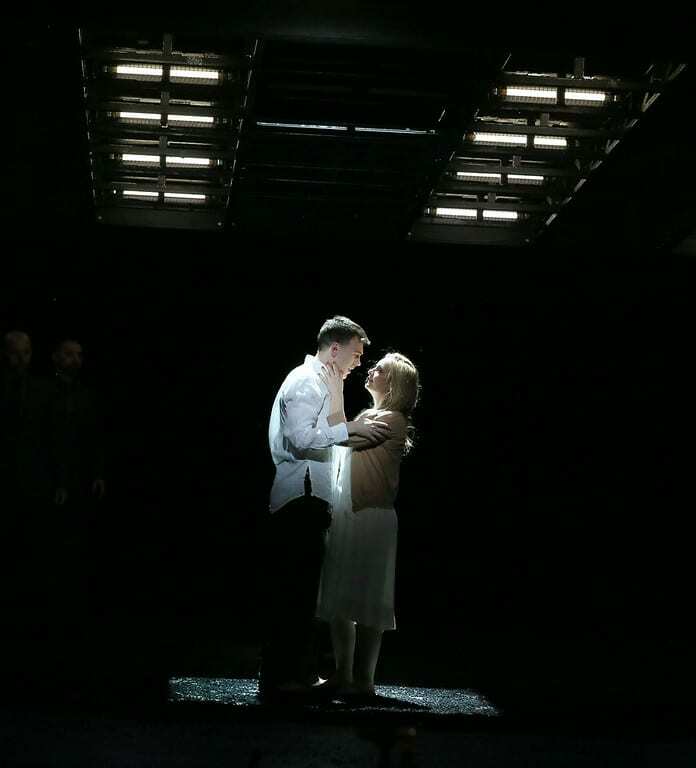 The battle between good and evil is dovetailed with the “Romeo and Juliet” romance of Tamino (Rupert Charlesworth) and Pamina (Lucy Crowe). They must both overcome themselves if they are to find true love. To balance this side of the opera we have the comic sub-plot centred on the jester figure Papageno (Thomas Oliemans, wonderful) and his search for love. All three plots dovetail to form a perfect work of art. A masterpiece in short. Fittingly this production has been dedicated to the late great Stephen Jeffreys whose superb translation brings “The Magic Flute” vividly alive for us today with highly original and inventive contemporary equivalents for us to work with. Simon McBurney’s direction should be the blueprint for every director who wishes to make opera live and be enjoyed by a contemporary audience. Again and again he finds an equivalent that allowed me anyway to make connections between 1791 and today. Like the reference to “Singing in the Rain” (1952) or the image of Grenfell Tower engulfed in flames as the lights take on the shape of the Towers windows. 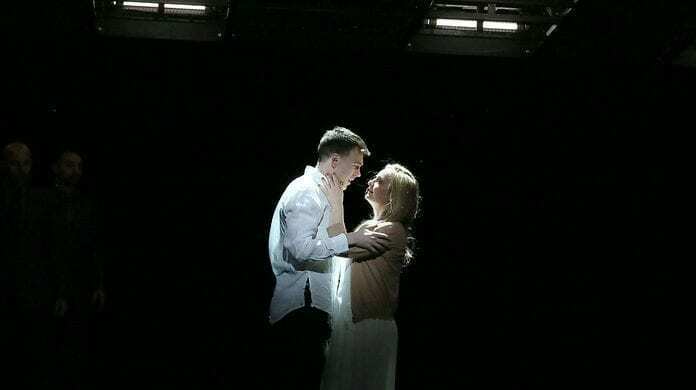 The “Star Wars” analogy allows us to understand that we are in a world where good and evil are fighting to win over the next generation represented by Tamino and Pamina. There are some great set pieces. Julia Bauer is spellbinding as she attempts to persuade Pamina to take the knife and assassinate her own father Sarastro (Brindley Sherratt) and he in turn shows the power of Enlightenment belief in goodness when he opens his arms and invites Pamina to knife him, warning her that she will lose her human grace if she does. This is the heart of both “The Magic Flute” and the Enlightenment. Can reason and kindness overcome the forces of darkness? That has been the question all of us have been grappling with since the first production of the “Magic Flute” in 1791 and on the morning after the massacre in Christchurch in New Zealand, it remains as urgent now as it was when Mozart composed it in 1791. “The Magic Flute” by Wolfgang Amadeus Mozart (1756-1791) at The Coliseum.